"Together with the children of a ´deprived area´, he brings art to their public space*"
"For MEGALÖTH, the children collected various items of cutlery from the neighbourhood and reformed and sculpted it with the help of Hannes Neubauer´s team. Afterwards, the ca. 500 cutlery pieces were included into a three meter high concrete column. Because the children and the locals were involved directly in the artistic working progress, they got a reference to their sculpture and by this to art and creation of the public space. The individually formed items of cutlery stand for the individual citizen in the community and the concrete column symbolises the architectural public space. 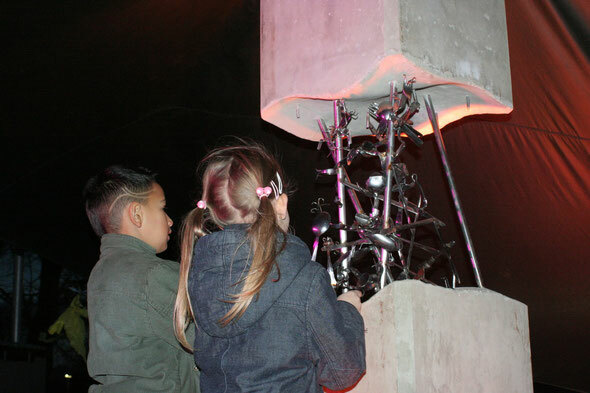 "Neubauer succeeded in the masterstroke, to set up a really interactive happening with his sculpture, which made the children eyes shining as well as the routined eyes of the television team, ..."